Re-cropping after Callisto or Command? Callisto and Command are relatively new herbicides to various horticulture crops in Ontario. They both cause bleaching symptoms even though Callisto is a Group 27 herbicide and Command is a Group 13. Group 27 and Group 13 herbicides are categorized as carotenoid biosynthesis inhibitors. Group 27 herbicides are also frequently referred to as HPPD inhibitors. This refers to the inhibition of p-hydroxyphenyl pyruvate dioxygenase (HPPD). The inhibition of HPPD gives rise to bleaching symptoms on new growth. Command injury on tomato due to drift. 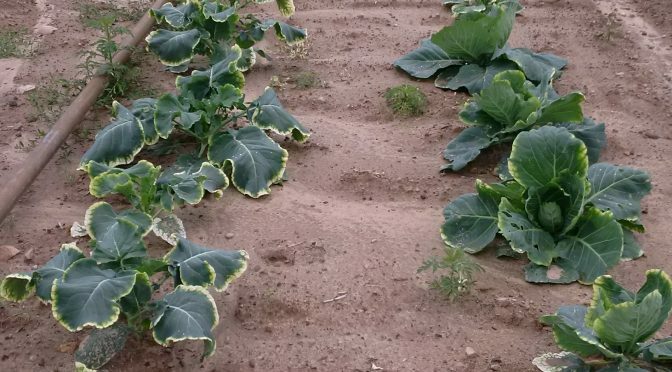 Command injury on cauliflower from heavy spring rains. Both Callisto and Command are broken down by soil microbial activity. Drought, cold temperatures and low pH soils reduce microbial activity. These herbicides are bound to organic matter which also reduces the rate of degradation. It is very important to know what herbicides have been used on any land prior to planting a new crop, to determine if there will be concerns with herbicide residues. This is particularly important when renting or trading land. Below is a table with the re-cropping intervals required in certain crops, for other crops consult the herbicide label.